KARIBUNI! 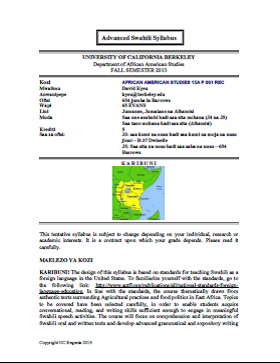 The design of this syllabus is based on standards for teaching Swahili as a foreign language in the United States. To familiarize yourself with the standards, go to the following link: http://www.actfl.org/publications/all/national-standards-foreign-language-education. In line with the standards, the course thematically draws from authentic texts surrounding Agricultural practices and food politics in East Africa. Topics to be covered have been selected carefully, in order to enable students acquire conversational, reading, and writing skills sufficient enough to engage in meaningful Swahili speech activities. The course will focus on comprehension and interpretation of Swahili oral and written texts and develop advanced grammatical and expository writing skills. Conversations and discussions will arise from the issues highlighted in the selected oral and written texts.